Dollar’s selloff accelerates entering into US session today and drags down the Japanese Yen too. Strong employment data may halt the greenback’s decline temporary. But it’s definitely not enough to trigger a reversal. 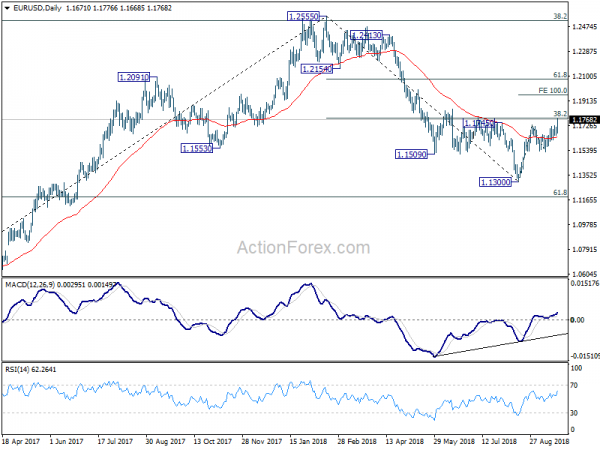 EUR/USD and GBP/USD are in proximity to key fibonacci level at 1.1779 and 1.3316 respectively. These two levels will be closely watched and firm break would trigger even deeper pull back in Dollar in short to medium term. Sterling is trading as the strongest one for today as held by upside surprise in retail sales. It’s a solid report with growth seen in all four retail sectors. Comments from EU officials in Austria also suggest that while the Irish border issue remains unresolved, all sides are working towards a solution, rather than away from it. New Zealand Dollar continues to ride on the stronger than expected Q2 GDP data released earlier today. Euro is trading as the third strongest for the moment. Australian and Canada Dollar lag behind. There is no clear reason for the free fall in Dollar. But given then all European majors are broadly firm, we’d believe that the trigger lies in Europe. And most likely, it’s the strong rally in German 10 year bund yield, which breaks 0.5 level. German 10 year bund yield dived through key support level at around 0.5% earlier this year on Italian political turmoil. It then struggled to reclaim this level as Italy debt worries continue while Turkish Lira crisis emerged. A break of 0.5, and staying above means Eurozone is finally back out of this near term crisis mode. US initial jobless claims dropped -3k to 201k in the week ended September 15, below expectation of 210k. It’s also the lowest level since November 15, 1969, when it was 197k. The four week moving average of initial claims dropped -2.25k to 205.75k, lowest since December 6, 1969. Continuing claims dropped -55k to 1.645m in the week ended September 8. It’s the lowest level since August 4, 1973. Four-week moving average of continuing claims dropped -20.75k to 1.6915m, lowest since November 17, 1973. Philly Fed business outlook diffusion index for current general activity rose 11 pts to 22.9 in August. , above expectation of 16.3. Six-month indicator dropped to 36.3, down from 38.8. SNB left monetary policy unchanged as widely expected. Sight deposit rate is held at -0.75%. Three-month Libor target rate is also kept between -1.25% and -0.25%. The central bank also pledged to remain active in the foreign exchange market as necessary. SNB lowered inflation forecast in 2019 by 0.1% to 0.8% today. For 2020, inflation is projected to be at 1.2%, sharply lower than prior forecast of 1.6%. Some economists take that signals that SNB will wait a long time to change its monetary policy. And the first rate hike could be postponed towards 2020. That is, SNB could wait some more time after ECB starting to raise interest rates beyond summer 2019. Sterling surges broadly again after August retail sales data beat market expectations. Retail sales include fuel rose 0.3% mom versus expectation of -0.2% mom. Retail sales include fuel rose 3.3% yoy versus expectation of 2.3% yoy. Retail sales exclude fuel rose 0.3% mom versus expectation of -0.3% mom. Retail sales exclude fuel rose 3.5% yoy versus expectation of 2.3% yoy. All four main sectors contributed positively to growth. In volume term, Food stores contributed 1.0% yoy, non-food stores 0.9% yoy, non-retailing stores 1.2% yoy and petrol stations 0.2% yoy. As the informal EU summit in Austria continues today, there are more comments regarding the Brexit deal that UK Prime Minister Theresa May is selling. There are still notable different in the issue of Irish border. EU chief negotiator Michel Barnier will brief the leaders of the 27 nations today and a unified position should be reached afterwards. For now, comments from EU officials suggested that they’re working towards deal, rather than away from it. Varadkar added that a “political border” does exist between Ireland and Northern Ireland. And “what we want to avoid is any new barriers to the movement of goods, any new barriers to trade, any new barriers to the movement of people”. On the political side, Abe would seek to amend the constitution to confirm the legality of the country’s self-defence forces. The current article 9 of the constitution was written by the US after the second world war, forbidding Japan to use forces to settle international disputes. But under regional pressure, Abe would likely retain passages that forbid Japan from war of aggression. But one way or the other, such change would be a huge test in relationship with its neighbor South Korea and China. On the economic front, Abe would continue with the three arrows of his Abenomics, ultra loose monetary policy, fiscal spending and structural reform. The next for Abe is social security reforms including raising retirement age above 65 and defer pension payouts beyond 70. The planned sales tax high from 8% to 10% will be carried out in October 2019. On monetary policy Abe hailed that “the biggest goal of our macroeconomic policy has been fulfilled as a result of measures taken by the government and the BOJ to achieve 2 percent inflation”. New Zealand GDP grew 1.0 qoq in Q2, doubled the speed of 0.5% in Q1 and beat expectation of 0.8% qoq. That’s also the fastest quarterly rate in two years. Over the year ended June 2018, growth also accelerated to 2.8% yoy, up fro 2.6% yoy and beat expectation of 2.5% yoy. Growth was broad based with 15 of 16 industries up. GDP per capita also gained 0.5%. Looking at more details, the 1.0% quarterly rise in services was the main contributor. Goods-producing industries were up 0.9%. Primary industries grew 0.2%, with strong growth in agriculture, forestry, and fishing offset by a significant fall in mining. Following up on Chinese Premier Li Keqiang’s pledge to further reduce tariffs on Wednesday, it’s reported that China is planning to cut average tariff rates on goods from the majority of its trading partners as soon as next month. Around 1500 consumer products lines could be included in the list. It is a follow up move to a similar tariff cut back in July on a number of consumer goods. So far, there is no official comments from the Ministry of Finance regarding the topic. The act is seen as a tactic in the trade war with US that achieve multiple purposes. Firstly, domestic consumptions can be boosted. Secondly, it can should to the world that China is working on opening its markets and it’s consistent with its own claim of advocating free trade. Thirdly, it’s unsure how the cut in tariffs affect US goods as the so-called most favored nation rate also applies. But the act will certainly give extra incentive for Chinese consumers to buy more non-US products. Daily Pivots: (S1) 1.1643; (P) 1.1680; (R1) 1.1709; More…..
EUR/USD’s rebound from 1.1300 finally resumes and surges to as high as 1.7766 so far. 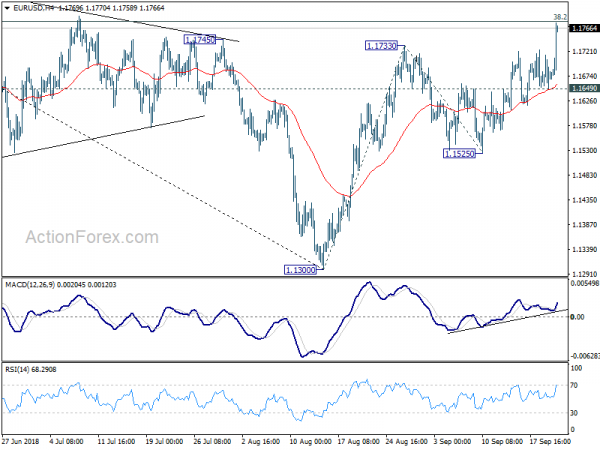 Intraday bias is back on the upside, with focus back 38.2% retracement of 1.2555 to 1.1300 at 1.1779. 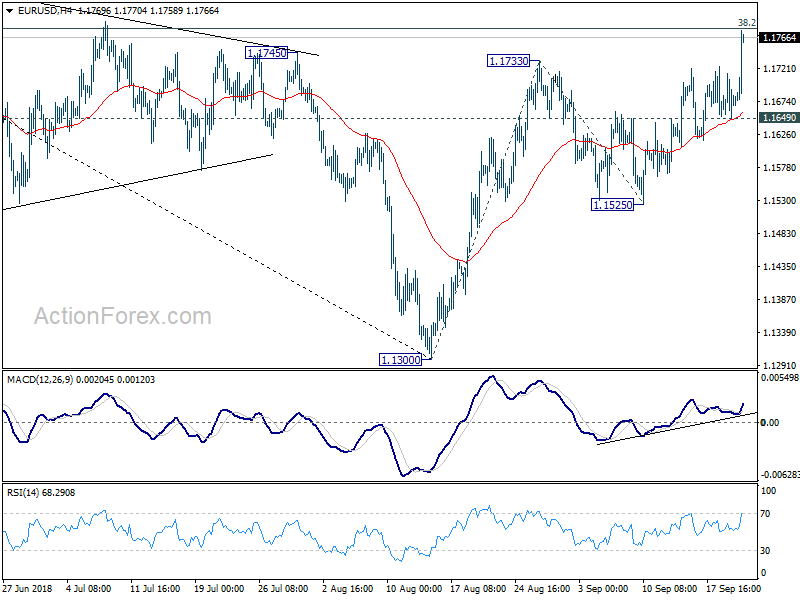 Rejection from 1.1779 and break of 1.1649 minor support will indicate that corrective rise from 1.1300 has completed. That will be in line with our original view and turn bias to the downside for 1.1525 support for confirmation. However, sustained break of 1.1779 will extend the corrective rise from 1.1300 to 100% projection of 1.1300 to 1.1733 from 1.1525 at 1.1958 before completion. In the bigger picture, a medium term bottom should be in place at 1.1300, on bullish convergence condition in daily MACD and some consolidations would be seen. But still, note that EUR/USD was rejected by 38.2% retracement of 1.6039 (2008 high) to 1.0339 (2017 low) at 1.2516. That carries some long term bearish implications. Thus, we’d expect fall from 1.2555 high to resume after consolidation completes. Below 1.1300 should send EUR/USD through 61.8% retracement of 1.0339 to 1.2555 at 1.1186. And, in that case, EUR/USD would head to retest 1.0339 (2017 low).